Of the same order of error as the girlies in the Telegraph who referred to Spitfires as "jets" (later corrected), we have a government which yesterday produced a "future partnership paper" demonstrating that they don't understand the difference between a customs union and a customs agreement. This ignorance is shared with the bulk of the media, which wantonly parades its own lack of comprehension, muddying the waters and confusing its own readers – and the politicians amongst them. But then I suppose it's really too much to ask of these simpletons to take on board the simple fact that that a customs union is primarily about removing tariffs between members and has nothing to do with the erection and maintenance of border posts, and border checks by customs (and other) officials. After all the time spent, such making such distinctions is totally beyond the ability of this whole range of people. Forever, they are locked into an entry-level pastiche which should not, if there was any justice get them through their GCSEs. We are doomed to a debate dominated by infants. The trouble is that when these uncomprehending infants are in government – some of them senior ministers – and they are tasked with writing policy papers, it matters. We cannot progress to sensible positions if those we rely upon have no grasp of the basics. We might just as well do a round robin of a sample of primary schools, for all the sense we will get. But there it is – starting with the executive summary, we get the classic non-sequitur which betrays the uncomprehending minds: "As we leave the European Union and therefore the EU Customs Union, the Government seeks a new customs arrangement that facilitates the freest and most frictionless trade possible in goods between the UK and the EU, and allows us to forge new trade relationships with our partners in Europe and around the world". This is tosh – unmitigated, crass stupidity – implying as it does (and fully amplified elsewhere) that membership of the EU Customs Union was the facilitator of free and "frictionless" trade. Specifically, we learn (para 21) that: "Membership of the EU Customs Union means that goods moving between the UK and other EU Member States are not subject to customs duty, quotas or routine customs processes (including the need to provide customs declarations). From that, it would follow that replacing the customs union would restore our trading relations to the pre-exit level. 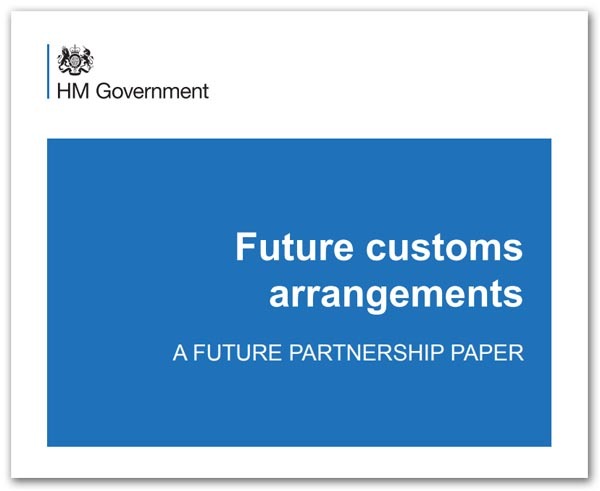 However, having started off from a false premise, the paper then goes on to talk about "a future customs relationship with the EU" that actually goes way beyond a customs union. In effect, it is talking (without declaring this to be the case) about replacing some or all of the Single Market provisions. Interestingly, throughout the entire document, there is no mention of the Single Market – not one reference. The term "Single Market" has been completely erased from the script, despite its presence dominating the entire publication – the spectre at the feast. A highly streamlined customs arrangement between the UK and the EU, streamlining and simplifying requirements, leaving as few additional requirements on UK-EU trade as possible. This would aim to: continue some of the existing agreements between the UK and the EU; put in place new negotiated and unilateral facilitations to reduce and remove barriers to trade; and implement technology-based solutions to make it easier to comply with customs procedures. A new customs partnership with the EU, aligning our approach to the customs border in a way that removes the need for a UK-EU customs border. One potential approach would involve the UK mirroring the EU's requirements for imports from the rest of the world where their final destination is the EU. Slipping down the document to the detail (such that it is), we then find the claim that the "streamlined customs arrangement" is based on the UK and the EU trading with each other essentially as third parties. This is a feline way of denying the obvious – that the EU is the "first party" and we are the "third country". In the entire paper, though, there are only three references to "third country" and none of them acknowledge that this becomes the UK status. Instead, it seeks to position the UK and the EU as equals, which is manifestly not the case. The UK view of its "third country" status, however, is at its most bizarre when it considers a scenario "without any further facilitations or agreements – in other words, a "no deal" scenario. Then, it has the UK treating trade with the EU as it currently treats trade with non-EU countries, while the EU would also apply the customs rules and VAT to imports from the UK that it applies to non-EU countries. In effect, therefore, the Government seem to think that "third country" status only applies in the event of us failing to reach a trade agreement – that somehow the inevitable consequences of leaving the EU and the EEA can be mitigated. With it labouring under this false impression, we are told that: "The Government believes that the UK and the EU should also jointly consider innovative approaches that could support UK-EU trade outside of a customs union arrangement, while still removing the need for customs processes at the border". The last clause is the give-away. The UK Government is seeking the restoration of Single Market privileges. That is what the Single Market does – it removes the need for customs processes at the border. And that isn't going to happen. The UK will be a third country and it will be treated as a third country. Similarly, the second option, the "new customs partnership with the EU" isn't going to work either. Again the suggestion is that we align our approach to the customs border "in a way that removes the need for a UK-EU customs border". That simply is not sufficient for the EU to remove its border controls. Look at the Blue Guide. With leaving the EU and the EEA, we lose free movement of goods. Our products will no longer be permitted free access. Instead, they must be routed via an importer, "a natural or legal person established in the Union who places a product from a third country on the EU market". The prospect of our aligning our approach is, in any event, not one which is going to go down well with the "Ultras" as it involves the UK mirroring the EU's requirements for imports from the rest of the world where their final destination is the EU. In other words, for import purposes, we become a regulatory satellite of the EU. With that, sneaked into the paper is a short comment (para 24) which tells us that customs is only one of the ways in which we control the movement of goods across borders. Achieving UK objectives in full, therefore, "will depend on other elements of the deep and special partnership and trading arrangements we secure with the EU". For details on these, we are going to have to wait. Nevertheless, nothing confronts the basic flaw here - the assumption that conformity with EU customs procedures is going to be sufficient for the EU to dismantle its border controls. It won't be enough, and the Government should know this. The UK will still be treated as a third country, and the full range of import provisions will be applied by the EU. That notwithstanding, no deal will be settled by 29 March 2019, leaving the Government to look at the need to "avoid any cliff-edge as we move from our current relationship to our future partnership". We would, it says, "benefit from an interim period, for the implementation of the arrangements, that allowed for a smooth and orderly transition". Here, its preferred model for an interim period is a "new customs relationship" which "could be delivered through a continued close association with the EU Customs Union for a time-limited period after the UK has left the EU". This, we are told, "could involve a new and time-limited customs union between the UK and the EU Customs Union, based on a shared external tariff and without customs processes and duties between the UK and the EU". And this is where the "girlie mistake" has its effect. A "new and time-limited customs union", even if the EU was prepared to agree one, would not deal with the "customs processes … between the UK and the EU". With only a customs union agreed, the full gamut of controls would take effect from Brexit day onwards. Thus, on the matter of customs arrangements, if this is all the Government has to offer, we are in very serious trouble. We are being taken on a one-way trip to fantasy island, where Mr Davis and his friends are pushing for scenarios which cannot happen and have already been ruled out by the EU, or which do not satisfy our needs. The government's position paper seems to be pretending that these benefits can be retained despite leaving the customs union. They say that they are seeking to achieve "the most frictionless customs arrangement anywhere in the world". Well, Britain is already a part of that, and it is called the customs union. The idea that Britain can leave that organisation, negotiate the exact same benefits as membership, and then go around negotiating new trade deals with other countries, is just nonsense. What is it, we wonder, about the EU that turns politicians' brains to mush, alongside their handmaidens in the media. Leslie slightly redeems himself by saying that "the only way to preserve free and frictionless trade with the European Union is continued membership of the customs union, as well as the single market". If he forgot the obsession with the customs union, and went for the single market, with a tariff-free deal, he'd be a lot closer. In fact, all he has to do is look at Article 10 of the EEA Agreement, which states: "Customs duties on imports and exports, and any charges having equivalent effect, shall be prohibited between the Contracting Parties". Every which way you look – except the direction the Government is looking – continued EEA membership provides the answer. But, unable to live with the real world, we find our politicians retreating to their fantasies. The last word comes from a formal EU statement, which rejects this attempted to convey that future trade can remain unchanged after to leave. "As Michel Barnier has said on several occasions, 'frictionless trade' is not possible outside the single market and customs union", the statement says. But they will not be told – and this paper brings yet another illustration of how far from reality we have strayed.